This Christmas morning, make the scene under your tree unforgettable. Delight your family with lightly scented presents and gift bags using your favorite Holiday Blend. That way, when the kids come crashing down the stairs they’re greeted with BOTH an amazing sight and wonderful holiday aromas! Trust us — it’s very easy to scent your wrapping and tissue paper. You just need a few supplies and a couple of days. So, if you’re a last-minute gift wrapper (pulling a Christmas Eve all-nighter!) this technique may not work very well; make sure to plan ahead. First, choose the wrapping and/or tissue paper you would like to have scented. Then pick your favorite Holiday Blend and add 1-3 drops onto a cotton ball. Place the wrapping/tissue paper and cotton ball in a large plastic bag, seal it shut, and let it sit for at least 24 hours. Please take care not to let the oil come in direct contact with the paper if you don’t want to risk a stain. Also, if you choose to use a large paper bag to hold the paper and cotton ball, keep in mind that the aroma will permeate through the bag. Want to add even more pizazz to those presents? Try this No Sew Felt Flower — easy, cute, and another great way to add some more passive diffusion to your holiday! Cut out felt circles of various sizes to create petals. Cut one slit from the edge to the center of the circle for each felt petal. Curve the shape of the petal by grabbing the point on either side of the slit, overlapping the pieces, then gluing the sides together. Repeat until the desired numbers of petals have been made. 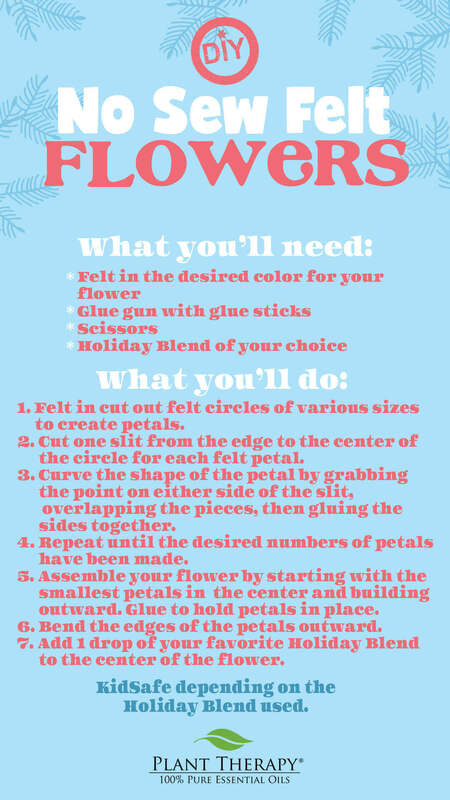 Assemble your flower by starting with the smallest petals in the center and building outward. Glue to hold petals in place. Bend the edges of the petals outward. Add 1 drop of your favorite Holiday Blend to the center of the flower. **The intention is to have the wrapping paper/tissue paper/felt flower be lightly scented. An aroma that is too intense may be unappreciated by the receiver or make them feel unwell. Please do this only for gifts for people you are familiar with and will not have an unsafe reaction to the oils used. What a crazy good idea! I will be making these flowers for other holidays. Works for all of them. I learn a lot in the Blog. The first time I made these was for my daughter for hair bows. I even made matching bow and pin set for her. She loved them and several of her friends wanted them. I just hadn’t even thought about dropping oils on them. Great idea. I think I will make some Christmas ornaments out of them and add pine to keep my fake tree smelling real. Cute idea to mix up the typical bow! This is the best idea! I would’ve never thought of this! Love the felt flower idea. Think I’ll try it with the kids. What a great idea and something the kids can help with! Will be adding gthese to some of our gifts this Christmas! Thank you! Oh what a fun idea. I would love to walk in carrying amazingly scented gifts! I bet these flowers would be cute to use as diffusers on the air vents of the car! These simple and easy craft idea are wonderful! I also would love to see pictures to go along with the instructions. The Holiday season and Christmas tree blends are perfect for the wrapping paper project! I’m excited to try this. I wish there was a picture of a finished one though. I’m definitely trying this! Fir Needle and Peppermint scented gifts sound perfect! Never try this before. Have felt stocks in store room. Definitely will try this simple steps. Such a cute idea. Can’t wait to test it out! Why haven’t I thought of this before?!! Thank you!! This is such a cute and festive idea! I’m going to have to try this for sure. Very creative! I am making these this year. 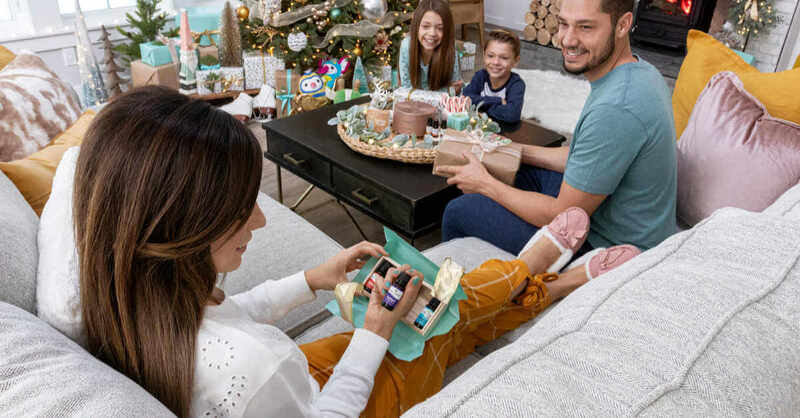 I’m always looking for creative ways to wrap gifts, and this is a great idea. Jodi, if you want to try it with an entire roll, just keep in mind you’ll need a bag large enough to seal it all up and also the wrapping paper near the center of the roll likely won’t get much aroma, if any. Honestly, I haven’t tried personally, so if you give it a shot let us know how it turns out! Such a fun idea! I think I will postpone my gift wrapping till next weekend so I can do this! How long does the scent last after gifts are wrapped? Great project to do with my craft loving daughter. I would love to see a picture of the finished product. Perfect, now I know how to use up some of my holiday blends! Surprised I ne er thought to make my paper smell good. Thank you PT! This sounds like an easy DIY for kids. I volunteer in an after school program and we always looking for projects that can be completed in half hour or less. The kids can take them hope with instructions on how the parents can add the oils. Well that is the coolest idea ever. I’Mm definately going to try scented tissue paper this year. such a fun idea! Im thinking a great addition to teacher gifts this year!! Sadly, I don’t ever have presents under my tree because I’m single with no kids or family nearby. I’m going to do this project and use it on wrapped boxes to give my tree a more festive look. Thanks!! Great idea and I’d love to try it. Is it possible for you to include a picture of what this gift wrap looks like when it is done? Such a great idea! Thanks for sharing, especially love that it is a no sew project! Thank you! This would be a fun project to do with the kids! This is a great idea. Will try to do it for Christmas gifts.